The Student Medical and Counseling Clinic is located in a recently renovated building on the southeast side of campus. 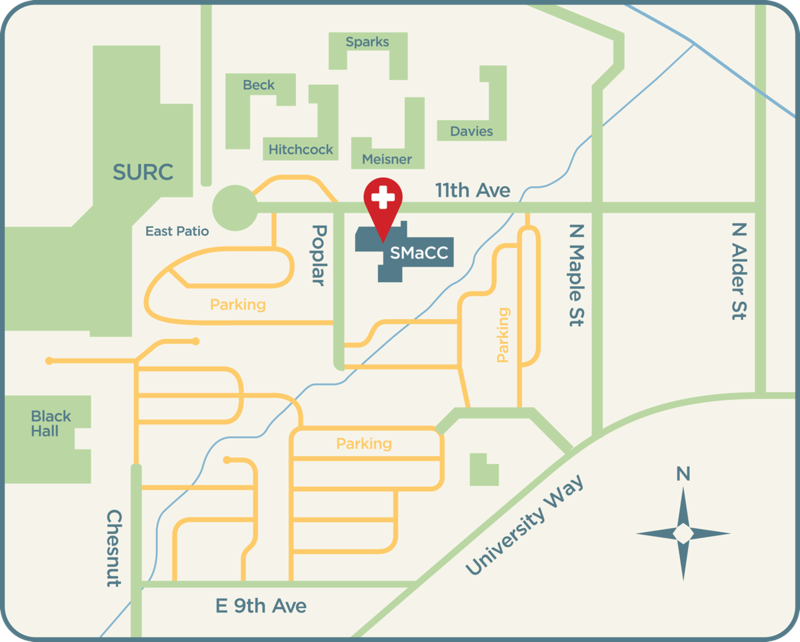 The Clinic is conveniently located for students, residing close to the Student Union and Recreation Center as well as many of the residence halls. For Clinic interns and staff, it is also conveniently located just across the parking lot from Starbucks. There is ample parking close to the clinic and the benefit of starting work at 8:00 in the morning is that one rarely has to complete with students to find a parking spot in the morning. Parking permits are available for purchase by interns for $214 for a calendar year. This cost can be prorated from your check each month. There is also some free street parking in the area for those who choose not to buy a parking permit, but you have to compete with students for these sought after spots. In 2009-2010, the Clinic underwent significant renovations including remodeling of our main meeting/group room, the addition of a new group room, opening of the front office area, and repainting the interior of the building. Our front office area is now open and welcoming to students, as well as providing efficient check-in services. The back office area allows all staff more freedom of movement and open spaces within which to do their work. Files, staff mailboxes, and essential office supplies are found here. The medical and counseling services each have a wing of the building, connected by the front office. The counseling wing of the building houses all counseling offices, a small library with books for lending clients and professional reference, and a garden area that is a work in progress. Intern offices are located in what is affectionately called “The Intern Nook,” which allows interns to be in close proximity to each other for peer support and consultation, as well as being centrally located to all senior staff. The Nook includes a sink as well as a place for frequently used reference books and resources. Intern offices are furnished with basic office furniture including a small desk, desk chair computer, phone, small couch, and chair. Interns are strongly encouraged to personalize their offices for the year. The Clinic’s main meeting and group therapy room is called “The Wickerath Lounge” and is equipped with resources for multimedia presentations as well as comfortable furniture. The second, smaller meeting/group room was created during our remodel. It is named “The Phoenix Room” as it was created out of the former incinerator room, but has been transformed into a light, pleasant meeting room. Of note, one of our former interns won the clinic contest to name this new room. The Clinic is fortunate to have a fenced-in backyard with a creek that in nice weather provides a great place to take a break and get away from it all for a bit. This area is also used for staff development activities, including the yearly ice cream social. The Student Medical and Counseling Clinic is a high volume clinic and we keep quite busy. However, we still try to take time as a staff to have fun. In addition to our spring ice cream social, we have a yearly winter holiday party, Birthday Buddies, Secret Valentines, and mark significant events in each other lives. There is also the Candy Bowl, a loving legacy from one of our most beloved staff members who recently passed away.